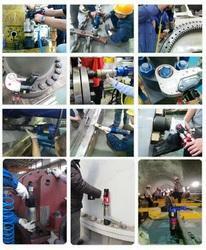 We Provide Onsite Bolt Torquing and Tensioning Services for Bolting on Flanges , Equipments , Structures , Shutdowns etc. Our Skilled Onsite Crew will take care of All your Bolting Needs with High Precision and Safety. Spaaj'S Bolting Solutions cater to the complete bolting work-flow, ensuring joint integrity and safety in applications throughout industry. Easy to fit and remove, turnbuckle type end bolts.They clamp top and bottom beams during operation. M/S Plant Tech Power Technical services Pvt. Ltd.